from the editor: I was recently invited to an event and offered to try a haircut at YGallery salon. My first thoughts were – um, no. Believe it or not, wild and curly hair requires a super curl master to keep in check. Maintaining this balanced pouf of curls in wind and humidity while attending fashion events is not an easy task. Where those curls land is all based on the cut, even if the even if the hair appears “unruly” to the “blow-out must” hair police. Not everyone can cut curly hair and make it look fashionable – I find most stylists would rather straighten my hair to show off the cut. That’s great, but I actually like my curls, and want them to look cool and bouncy – not straightened every day. Onto the next possibility – “balayage” highlights, and I thought, why not? I have so many colors in my hair naturally, this seemed fun + safe- going a little brighter with more natural looking highlights for summer. I was still a little hesitant, considering this wasn’t my usual hairdresser that knows me, but I figured it can always work it in the summer- as the sun usually brightens my hair, no harm. After confirmation, I got a couple of reminders for my big day of balayage. I walked a few blocks in my local SoHo, and met YONI, one of the founders of the salon duo [Yoni and Yaniv] on lafayette and broome. He was nice enough, the space is open like a loft, unpretentious, downtown – enough stations to “not be afraid” and a nice balance of girls and guys working… nothing scary so far. We talked a bit about my hair and the color(s) we wanted to go, the usual stuff. YONI explained a bit about the YGallery salon Balayage Lightener process, Unlike normal highlights, it’s like “painting” your hair freestyle. After he started, I noticed the “brush strokes” – he looked like he was painting my hair like a master; I relaxed. I was offered a glass of wine, and after seeing what was going on, I went about chill-axing and updating socials on my phone. I would look up once in a while, the speedy brushstrokes looked confident- I was at ease. We talked about more benefits from these highlights: there is no foil used, requires less maintenance, and allows more time for roots to grow in with a natural look. Sounds great, will see! As I was getting a wash after, Yoni mentioned my hair was dry (shocking) and perhaps we should try a conditioning treatment. I was offered a “white diamond” hair treatment, which would help moisturize and add shine to my hair. Of course I said sure. Now comes the interesting part: Unlike a typical mask, this treatment that helps your hair sort of “shine like a diamond” requires a product and a tool. The mask is a Y Gallery cocktail of argan oil and the treatment requires using an ultrasonic wand that looks like a flat iron used. Almost like a hot oil treatment but there is no heat, just light. The treatment helps smooth your hair, makes it less frizzy. Here’s the bonus, if used after color, where the cuticle of hair usually remains open for up to 4 days, this treatment helps “close” it immediately, with no waiting. At this point, I felt comfortable enough to say “yes” when YONI asked, “could I just shape your hair?” I said OK. The results? awesome fine and more natural looking highlights, my hair looks smooth and healthier, and my curls are bouncy. I can go conservative wave, cool wave, naturally curly, and a styled “do” thanks to getting a real haircut – not just a trim. Take a look at the pics, including the before and afters… no further explanation needed. I am now a regular getting my hair styled before events, and the guys are pretty awesome. Like my undo? 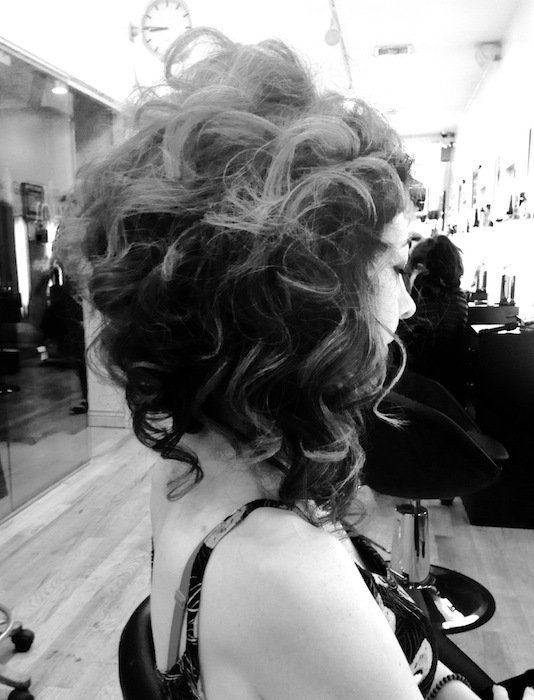 If you’re ready for a trendy style change in the hands of experienced master, go check them out. YGallery Salon is located at 180 Lafayette street, SoHo. Ygallery: hot hair for summer written by Brigitte Segura. 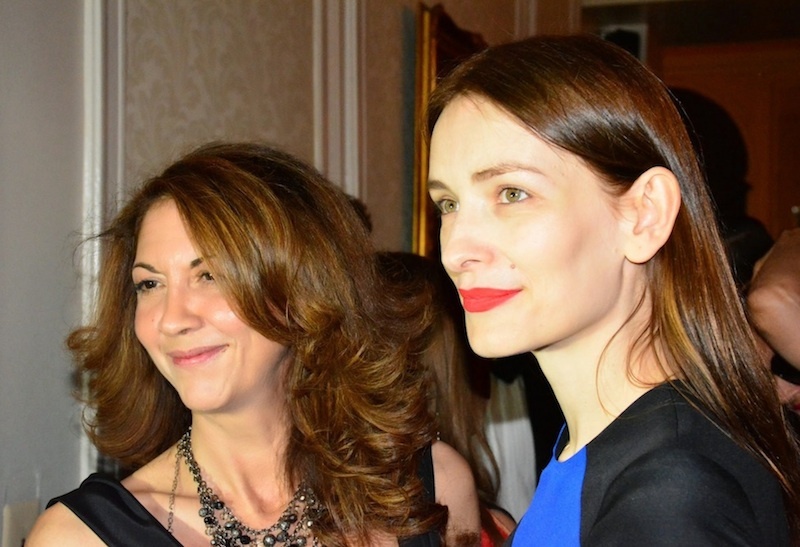 Brigitte Segura (hair by Yoni) with designer ROKSANDA ILINCIC at princess of serbia benefit, photo by courtesy. Brigitte Segura (hair by Yaniv) at J fashion show at One World Trade Center photo by Andrew Werner | FashionDailyMag. Brigitte Segura with Alber Elbaz, Stefano Tonchi at FIT Gala 2014 (hair by Yoni), photo Andrew Werner | FashionDailyMag. Brigitte Segura with model Andre Bona at Milk studios during NYFW photo by Allison Ripa | fdmLOVES.com. Brigitte Segura with model Guerrino Santulliana at Bosideng during NYFW fall 2014 by Andrew Werner | fdmLOVES.com.